Obituary for Ella Mae Mais | Rhoney Funeral Home, Inc.
Ella Mae Mais, of Niagara Falls, NY, passed away on Wednesday, August 15, 2018, in the Schoellkopf Health Center. 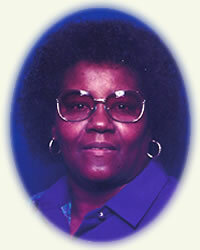 She was born in Gantt, AL, on August 4, 1936, the daughter of the late O'Neal "Sambo" and Beatrice [Curry] Hunt. Ella Mae had lived in Niagara Falls before moving to Lake Placid, FL in 1980, were she became a nurses assistant with several healthcare facility, before moving back to Niagara Falls, in March of 2013. She loved spending time with her family, fishing and taking care of her dogs. Ella Mae was the wife of the late Uriah Mais, who passed away in February of 2013. She is survived by six sons Jurel (Muriel), Jeffrey (Pearline), Brian (Lucinda), Timothy (Flo), Roderick and Danny Hunt, two daughters Lisa McCreary and Beverly Ann Marzilli, four brothers O'Neal "Fat Sam", Aubry, Willie (Patricia) Duane (Charlene) Hunt, four sisters Ray Bell (Dennis) Gulley, Judy (late Johnnie) Noye, Phyllis "Diane" (Gary) Kravitz, Geraldine (Wayne) Vanderhider, also many grandchildren, great grandchildren, great great grandchildren, nieces and nephews. Ella Mae was the mother of the late Thomas Hunt and sister of the late Mary Nell Downing. Her family will be present on Sunday from 4-5 PM at the Kingdom Hall of Jehovah's Witnesses, 3200 17th Street, Niagara Falls, NY, where services will follow at 5:00 PM.